This boutique-style hotel is an exquisite blend of modern luxury and impeccable service. Our premiere setting with a stylish and inviting atmosphere is known to our guests for being a home away from home. Service is our specialty and we deliver to every guest on every stay. 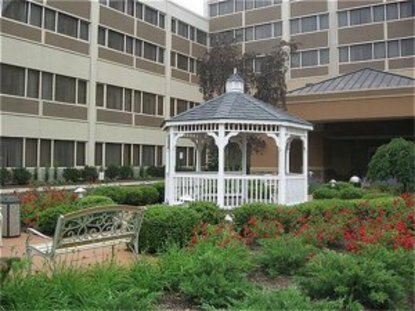 We are conveniently located at exit 135 off the Garden State Parkway, 9 miles south of Newark International Airport and just 2 miles from Rahway Train Station for convenient access to Newark or New York City without the expense. Businesses: L&regOreal, Schering Plough, Merck, Exxon Mobil, Bank of America. Hospitals: Rahway, St. Barnabas-Union, Trinitas, OverlookUniversities: Seton Hall, Kean Sneak nine in at nearby Hyatt Hills Golf Course with driving range and miniature golf Stay connected... with complimentary wireless high-speed Internet access. Stay fit... choose from our state-of-the-art fitness facility or access to Bally&regs Total Fitness. Stay restful... Our Sleep Advantage program goes well beyond the limitations of any other brand by creating the optimal sleep experience.Stay for convenience... a delicious meal, meeting or event is an elevator ride away. Stay confident... our small town, suburban setting and 24-hour security offer the peace of mind you deserve. This hotel is committed to providing accessible facilities under the American Disabilities Act. If your accessibility needs are not met, please contact the Hotel Manager on Duty. Should you require additional information regarding accessible facilities for guests with disabilities, please call 1-800-Holiday (U.S. and Canada) or contact the hotel directly. For the hearing impaired, TDD service is available at 1-800-238-5544 within the U.S. and Canada.